It’s been a week now, and it still doesn’t feel right. Nope, the sight of Will Grigg in red and white - as opposed to blue and white - will take some getting used to. But that’s football...life goes on...it is what it is (insert your own favourite cliche). There’s another: The king is dead. Long live the king. And when Leon Clarke marked his second Latics ‘debut’ with a goal against QPR on Saturday - shortly after Grigg had been unveiled up at the Stadium of Light - it marked the changing of the guard. Of course, we jest, and no-one will ever forget Grigg, or the contribution he made during his three-and-a-half years at Wigan. His legendary status is assured. And it wasn’t just on the pitch Grigg made his mark. Off the field, speaking to his team-mates, there wasn’t a more popular bloke at the club. Quiet, modest, unassuming, with the driest sense of humour, just what you need in the dressing room. From a media point of view, a reporter’s dream...always available win, lose or draw. And a marvellous ambassador for our Joseph’s Goal charity, generous with his time (and kit to raffle/auction). Like the vast majority of Latics fans - and chief executive Jonathan Jackson - I’m gutted he’s gone. But I also know that the £4million offer from Sunderland was too much to turn down. If anyone didn’t understand that last week, they surely would have when the club’s latest accounts were published on Tuesday morning. With parachute payments no longer on offer, Latics lost £7.7million in the year ending May 31, 2018. In a successful year when they won the League One title AND reached the quarter-final of the FA Cup. Sadly the blueprint for the future is hugely reliant on player sales. And with Nick Powell turning down a move to Brighton last summer, Latics had a huge hole in the budget they simply had to fill. From the player’s point of view, the opportunity to play in front of 30,000-40,000 fans every other week - and become a hero on a much bigger stage - was clearly appealing once the bid was accepted. And from Sunderland’s point of view, bringing in Grigg almost certainly guarantees promotion back to the Championship. It’s a deal that makes sense for all three parties, and hopefully all three will thrive. Switching back to Latics, the arrivals of Clarke, Danny Fox, Anthony Pilkington, Beni Bangimine and Jonas Olsson gives the squad a stronger look than at the beginning of the window. And with the imminent return of the likes of Powell, Gavin Massey and Antonee Robinson, Paul Cook’s options look greater than at any other point in the campaign. One that should keep them well clear of the relegation dogfight taking place below them. A massive thanks to everyone connected with Latics for inviting me to Euxton on transfer deadline day to experience what really goes on behind the scenes. The term ‘access all areas’ wouldn’t even do it justice - I was in Jonathan Jackson’s office when Beni Bangingime arrived with his mum and dad to sign his contract! I don’t recall seeing any other football club grant even remotely similar privileges to an ‘outsider’ to report on goings-on. And I can confidently say - having spoken at length to every single one of the powers that be - they couldn’t have the club’s best interests more at heart. Not content with being the best right-back in the Championship, Reece James showed at the weekend he could also possibly be among the best central midfielders. Hard to believe this kid is still only 19...it’s truly staggering how good he could be in years to come. Perhaps the only thing more staggering is the idea Chelsea may be prepared to sell him - without kicking a ball for their first team - if rumoured interest from Brighton and Crystal Palace materialises. The game truly has gone if that happens. Great to see Leon Clarke up and running already during his second stint at Wigan Athletic. 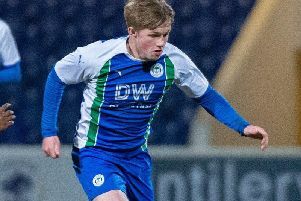 Some fans have been too quick to point to Clarke’s previous loan spell with Latics four years ago, during Malky Mackay’s time in charge - which produced one goal. Of far more relevance, I would suggest, is his 19 goals last term which saw him named in the Championship ‘team of the season’. And first impressions suggest his capture will prove to be extremely shrewd indeed. Just when Manchester City thought they had a free run at the FA Cup this year with Latics being out, suddenly in their way stands Newport County - and ex-Latics man Michael Flynn!